Brad Hughes is the director of the Writing Center and director of Writing Across the Curriculum at the University of Wisconsin-Madison. He is delighted to be starting his 32nd year as director of the Writing Center. As we start a new academic year, this seems like a good time to celebrate an important anniversary for our Writing Center. This year the online portion of our Writing Center at the University of Wisconsin-Madison (writing.wisc.edu/) is celebrating its 20th anniversary–or its 21st, or 22nd, depending on how you count; I will explain in a minute. (Our Writing Center as a whole is heading toward its 50th anniversary in a few years.) Since our base-ten number system makes 20 seem like a significant number and since this story hasn’t been told, I thought it would be fun to trace the history of our center’s online presence. And I thought it would be fun to reveal some out-of-date web fashions–that’s our original website in the featured photo above:-). 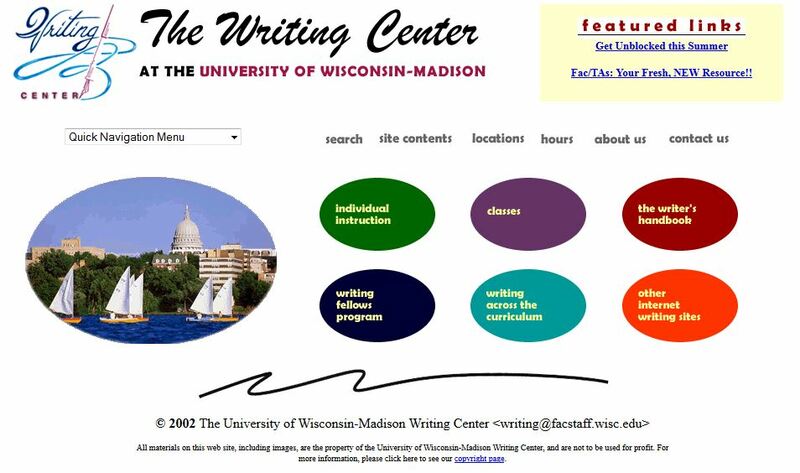 Over the decades, our Online Writing Center has become an integral component of our Writing Center programs at UW-Madison. In fact, I’m a big believer in convergence—that is, I believe that those of us in the writing center profession should stop thinking of online and in-person programs as distinct, but instead as productively, even magically, intertwined. One more key reason drives my passion for what we do online: increasing student access to all that a writing center does. Just as our evening and weekend hours in residence halls, multicultural-student centers, campus libraries, and public libraries across our city make our center more accessible and more inclusive, so do all of our online offerings. Over the years the content of our online site has grown steadily, thanks to the hard work and the vision of countless members of our staff. And the reach of those materials—the number of links to our materials and the number of readers around the world–has grown in ways that amaze us. In October 2014, for example, our Online Writing Center had over 6 million hits from over 548,000 unique visitors from around the world–just in that one month. As is the case for most writing centers, our online site is now the front door for our center’s programs—providing information for students and faculty and writing center colleagues at other universities about our programs and locations and staff. As we have updated our descriptions of our programs and pedagogy, we have tried to follow Mickey Harris’s great advice, in a 2010 Writing Center Journal article, about creating sticky institutional discourse for our websites. Each year we offer written feedback and screencast feedback on hundreds of drafts written by UW-Madison student-writers. We also offer synchronous consultations to students—using Skype and Google Docs—five evenings a week during the academic year. Through our writing consultant, we offer answers to brief writing questions, which come from business professionals and students and teachers and government workers around the country. We offer information about our Writing Fellows Program for students and faculty, as well as online applications for prospective fellows. We provide descriptions and registration forms for some 60 sections of Writing Center workshops and writing groups that we offer each semester. Online, faculty can request class visits and co-teaching that we do with colleagues across campus (what we call outreach). In our Writer’s Handbook, we offer hundreds of pages of online reference materials about various aspects of academic writing—from advice about writing in common genres (reviews of published research literature, research posters, annotated bibliographies, close readings in literary analysis, resumes, and many more), to advice about the writing process and sophisticated samples, written by UW-Madison faculty and students (about introductions or paragraphing or acknowledging sources and avoiding plagiarism, for example) to advice and samples of major documentation systems, with sample citations featuring publications by UW-Madison faculty (including IEEE, APA, MLA. Chicago/Turabian, CSE and more). 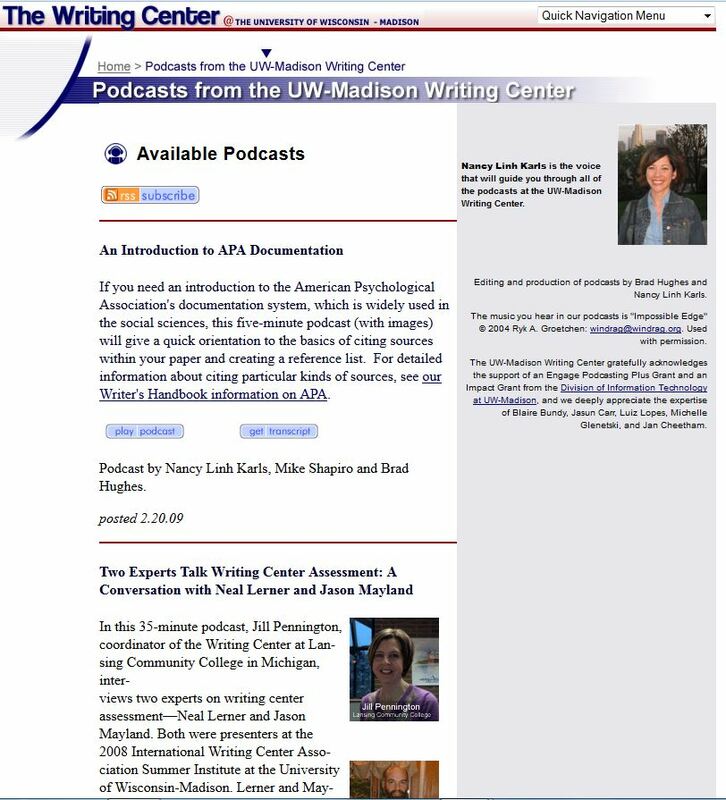 We offer instructional and professional podcasts, including, for example, interviews with experts about writing center assessment. In an article in The Writing Lab Newsletter, my colleagues and I shared some of our thoughts about principles for designing writing center podcasts (Vee, Shapiro, Karls, and Hughes). We host research sites for the Peer Writing Tutor Alumni Research Project and for our simulation-authoring software, CS/CR Builder. 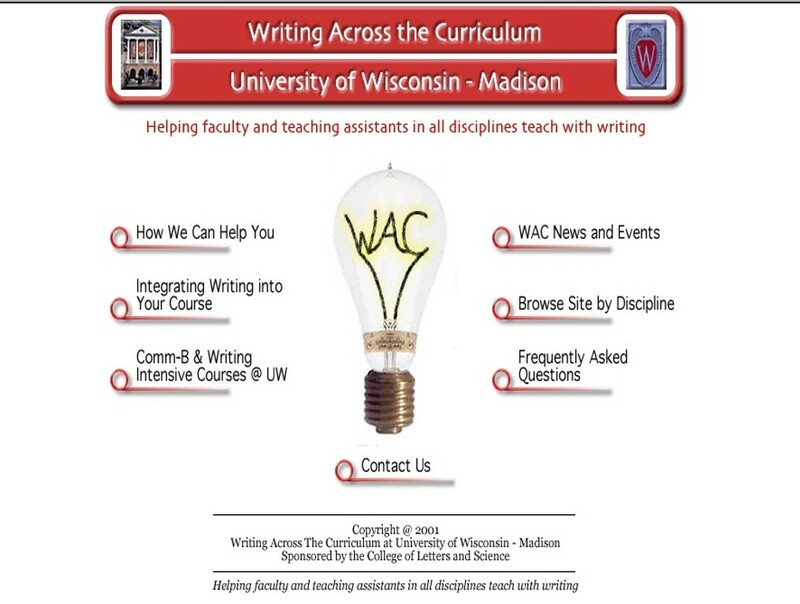 We have a large Writing-Across-the Curriculum site used by faculty across UW-Madison and at many other universities. 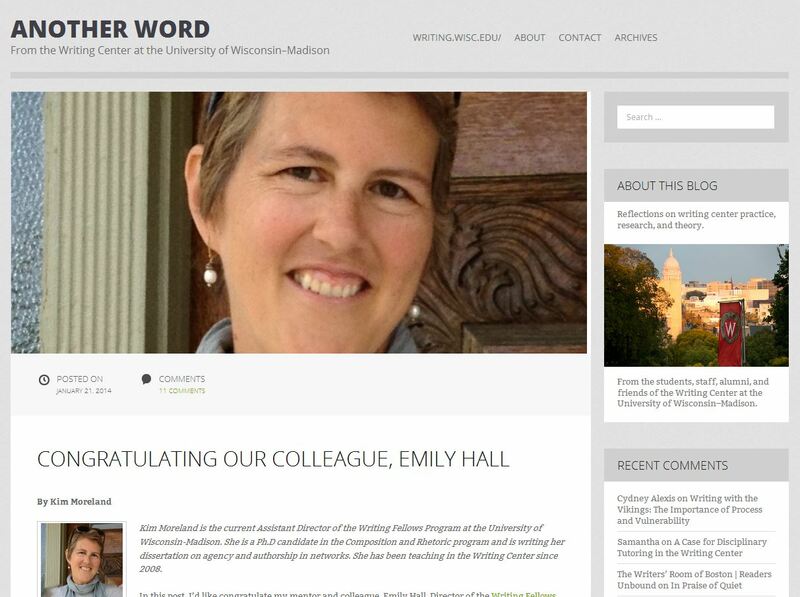 And we host our Writing Center’s blog, Another Word, which you are so kindly reading right now. Our blog–which features reflections on writing center practice, research, and theory, written by our current staff, alumni, and friends—had 205,000 page views in October 2014 (in that one month alone) and 239,000 in November 2014. 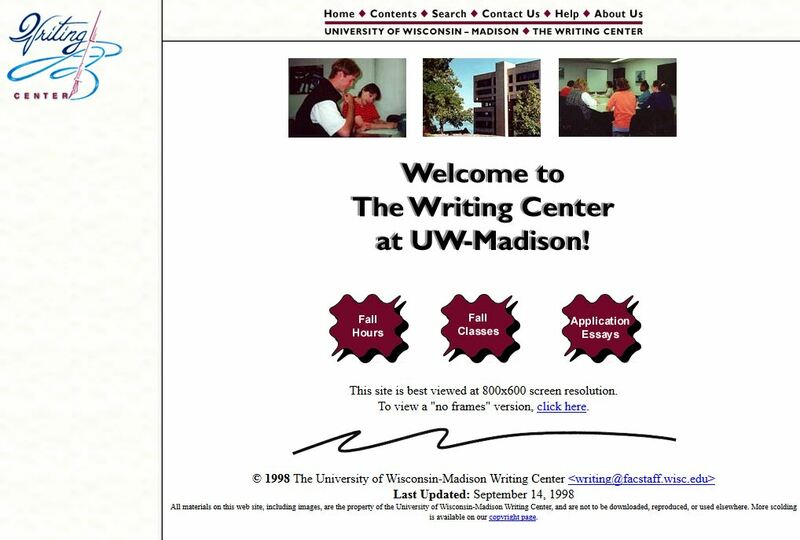 Our Writing Center actually had a presence on the Internet well before we launched a website in 1995. For a couple of years, we had what was called a “Gopher site,” a simple way to deliver text files on the Internet, a system which pre-dated the graphical, hypertext system for websites. Gopher sites could have menus and text files. (It was named “Gopher” in honor of the sports mascot at our wonderful neighbor to the west, the University of Minnesota, where it was developed.) I cannot seem to find an image of what our Gopher site looked like, but it was something like my re-creation just above this paragraph, delivering basic text information about our services and basic versions of some of our handouts about academic writing. I actually remember vividly the first time I saw the World Wide Web, in 1994, using the early browser Mosaic–someone at the Division of Information Technology (DoIT) on my campus showed me a website from Australia or New Zealand (can’t quite remember) and I thought (quite profoundly, I’ll tell you) that “This is going to be big . . . and I want our writing center to be part of it.” I loved the graphical and visual nature and the hypertext links, which were all brand new on the Internet at the time. I also remember a few years later that my daughter had a short writing assignment in first grade to introduce and explain the Internet and to explain some new thing called email to her parents. In response to that small scheduling invitation, our Writing Center was supremely lucky to have two fabulous teaching assistants on our staff express interest and then work creatively and tirelessly to develop our first website–Erin Denney, who is now on the faculty at the City College of San Francisco, and Matt Livesey, who is now on the faculty at the University of Wisconsin-Stout. My dusty date book tells me that Matt and Erin and I met every week during the spring of 1995, to plan and then launch our Writing Center’s first website (don’t ask why I still have my calendar from 1995). We had the help of a graphic designer in the Division of Information Technology on our campus, who thought that the hand-drawn, colored-pencil, retro look of the graphics and icons on our first website would match the ethos of our center. Our first website, launched in 1995. Image from the Internet Archive’s Wayback Machine. An interior menu, from our original website. From the research they did about other online writing centers and from their development work on our site, Erin and Matt published, in 1996, an early article in The Writing Center Journal about online writing centers, titled a “Review of Internet Resources for Writing Centers.” This article features an annotated guide to “some of the most impressive and distinctive” (186) then-existing Gopher sites, web sites, and MOOs [“Multi-User Object Oriented”]. a text-based synchronous communication system used for some of the earliest online consultations by writing centers]. As Denney and Livesey explain, “The WWW provides an ideal method of transmitting information both globally and locally. Whereas Gopher is limited to a menu structure, the Web’s use of hypertext links, both between documents and between different parts of documents, allows material to be structured in multiple ways. Because it is not limited to ASCII characters, the Web also allows much more complex formatting of documents than does Gopher. . . . The variety of type size, colors, and even graphics and pictures helps the Web function as an effective tool for teaching writing” (185). In 1996, Denney and Livesey already found 58 online writing centers, thirty of which had information of global interest (i.e., reference materials about writing and research links that go beyond merely local information about hours and locations for a particular university’s writing center) (185-86). 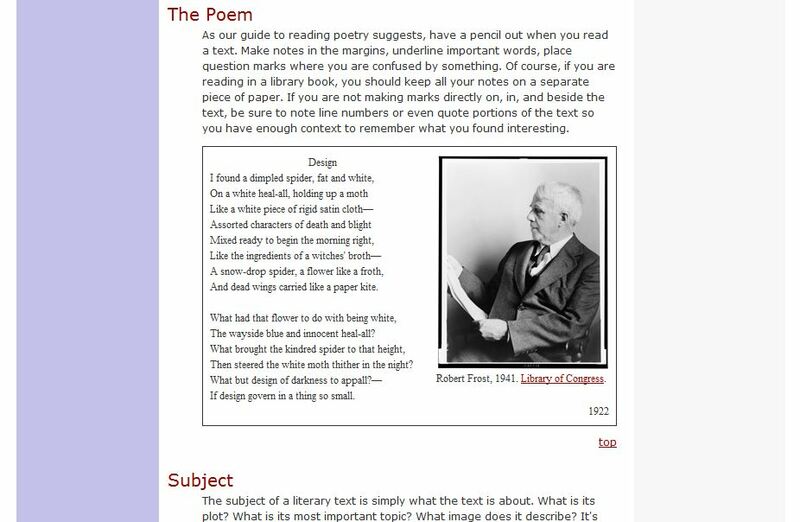 What follows below are some screenshots, many from the Wayback Machine’s Internet Archive, of the home page of our evolving Online Writing Center. As you can see from those images, the home page and the design of interior pages for our online Writing Center changed periodically over the years. We moved to frames when they were in. We then moved away from frames when they proved cumbersome and problematic. 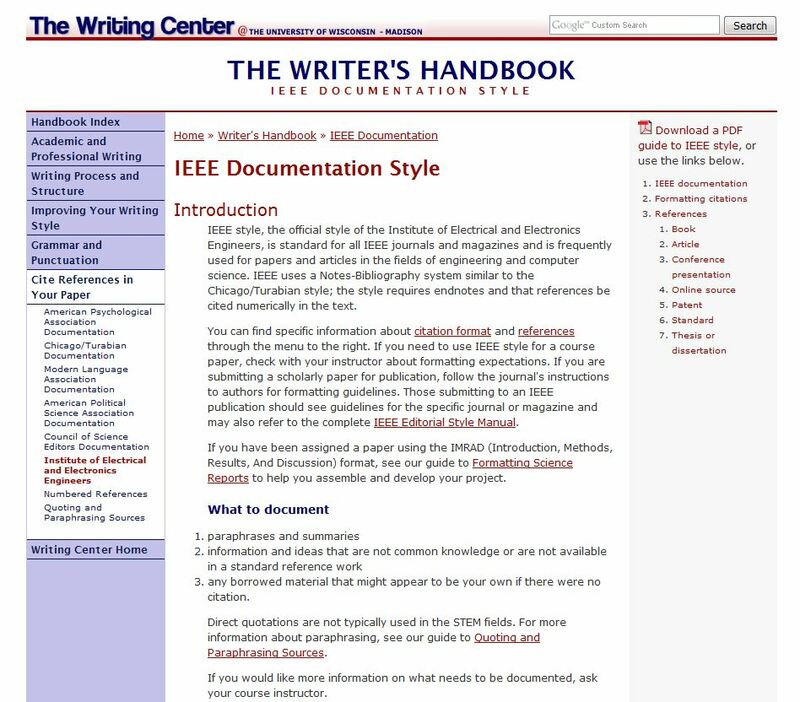 The new frames version of our website in the later 1990s even drew some fairly harsh criticism from Bruce Pegg in “UnfURLed: Twenty Writing Center Sites to Visit on the Information Superhighway,” in Wiring the Writing Center (1998). Although we were glad to make the list of 20 sites worth visiting, the description of our Online Writing Center began in this way: “This site has recently been updated as a bordered frames site, and stands as a perfect illustration of the inherent problems with the frame concept; though the header and the main frame fit nicely on the screen, the left-hand frame is too small for the menu bar contained inside it, making it difficult to use” (213). A fair enough criticism as I recall. At least in the next paragraph, our site earns some praise for its “Writer’s Handbook.” And my colleagues and I were grateful to have this kind of review instead of what appears on the previous page of this book, in a description of another university’s writing center site: “This is another neglected site which needs to perform a thorough revision of all its pages” (212). The frames version, from September 1998. For some reason the menu text in the left-hand frame disappeared from the Wayback Internet Archive. Maybe it’s just as well! Our home page from 2002. On our home page and on interior pages, we abandoned the friendly pencil graphics. We moved to abstract shapes for the menu choices. We abandoned those for an arc. We changed the arc. We then abandoned the arc. We later changed color schemes, more recently adopting some of our university’s signature red, but not using one of the university’s standard web templates and not choosing too patriotic a red. And we added photos of our consultations and workshops and writing groups as well as a featured links section. Our home page from 2009. An interior menu from 2009. Our home page from 2013. 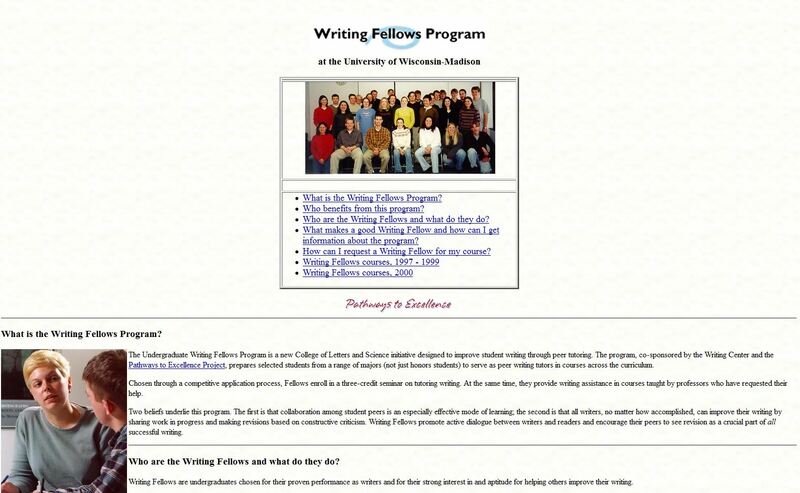 Our Writing Across the Curriculum website for faculty debuted in 2001. 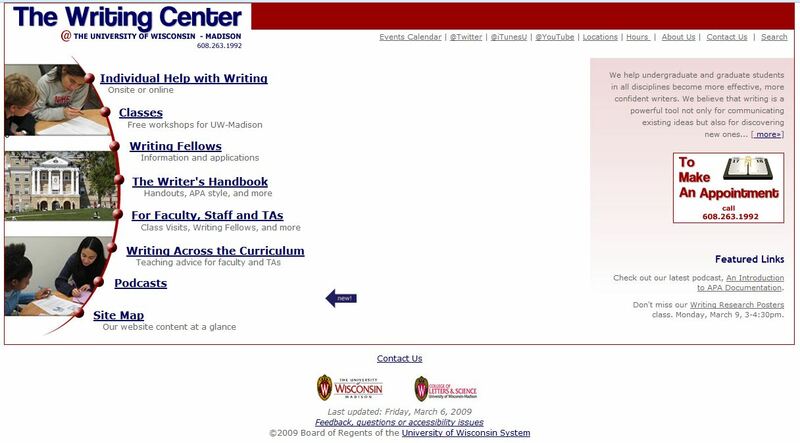 Developed by Tony Clark, an undergraduate computer science major, and Rebecca Schoenike Nowacek, then the TA Assistant Director of WAC and now on the faculty and director of the Ott Memorial Writing Center at Marquette University, our WAC website was a very early example of a content-management system, all created with open-source programs. Our current WAC website, pictured below, created with the open-source content-management system Drupal, debuted in 2012. It features hundreds of pages of advice and sample assignments created by faculty and instructional staff and teaching assistants from disciplines across our university. We launched our blog in September of 2009, thanks to the vision and passion and tech savvy of our former TA coordinator of our Online Writing Center, Rik Hunter, who is now on the faculty at the University of Tennessee at Chattanooga. 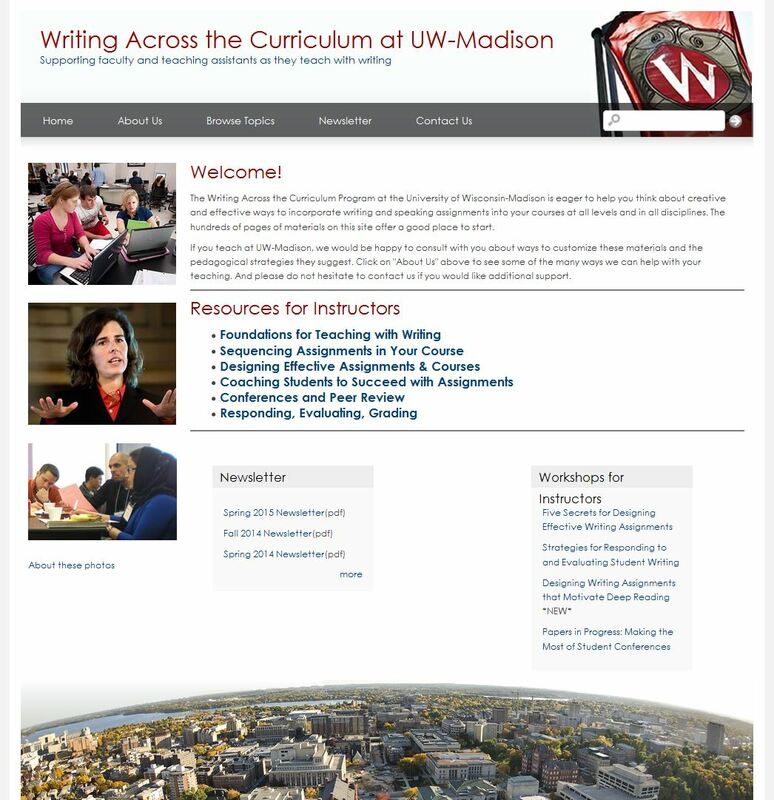 And in the fall of 2013, we launched a new look for our blog, thanks to the great leadership and design sense of our then-TA-coordinator of our Online Writing Center Mike Shapiro, who now teaches in the department of Engineering Professional Development at UW-Madison. Thanks so much to YOU for reading this post and for being interested in the history of our Online Writing Center. And I want to share some thanks with those who created and sustained all of this. A huge thanks all of the fabulous coordinators for our Online Writing Center, and to the Writing Center’s career staff, and to the TA assistant directors of the WAC program, and to all of the TAs who have been part of our online staff, and to all of the brilliant instructional designers and graphic artists and web experts at UW-Madison’s Division of Information Technology (including Kathy Christoph, Les Howles, Blaire Bundy, Michelle Glenetski, and John Thomson) and Learning Support Services (including Sara Niemendorf Nagreen and Sue Weier), and to the great IT staff in Helen C. White Hall (including Greg Putnam, Will May, and Andrew Leinberger) who have made this all possible. And a big thanks to DoIT for generously awarding us many instructional technology grants to us over the years. We could not have created this writing center online or had the success we have without the genius and dedication of all of these colleagues. And another big thanks to the Wayback Machine for its indispensable work of archiving the web. And finally a big thanks to all of the faculty and students at UW-Madison and at universities around the US and all over the world who have found our online instructional materials and services valuable. Those of us who work with our Online Writing Center know well that despite all the changes over the years, our web offerings and design and platforms and methods for online consultations need updating. 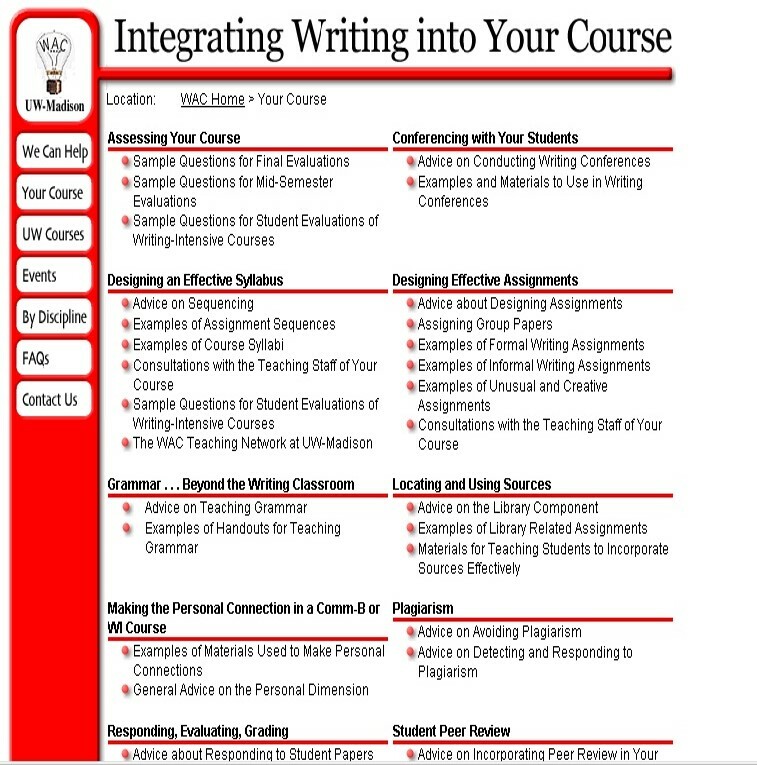 I have concluded that they will always need updating, and they will, I hope, always continue to evolve–that’s part of the joy and part of the inevitability with electronic publication and of course that’s true with Writing Writing Center programs in general. My colleagues and I are always deeply committed to improving everything we do, at the same time that we always have to recognize the limits of our time and resources. So what do you think, looking back through this history? Do you like the cheery, hand-drawn fountain pen on our original home page, or does that look hopelessly dated and goofy? Did any of this history surprise you? What do you think about the principles of “convergence”? Do you have any questions about the history of our online writing center? What did I miss in telling this story? Do you have suggestions for how we can improve what we do online? Would you tell this history differently? Would you be willing to share a little history of your online writing center? Please add a comment to this post–we would love to have your voice there. Denney, S. Erin, and Matthew J. Livesey. “”Review of Internet Resources for Writing Centers.” The Writing Center Journal 16.2 (1996): 183-93. Print. Harris, Muriel. “Making Our Institutional Discourse Sticky: Suggestions for Effective Rhetoric.” The Writing Center Journal 30.2 (2010): 47-71. Print. McKinney, Jackie Grutsch. 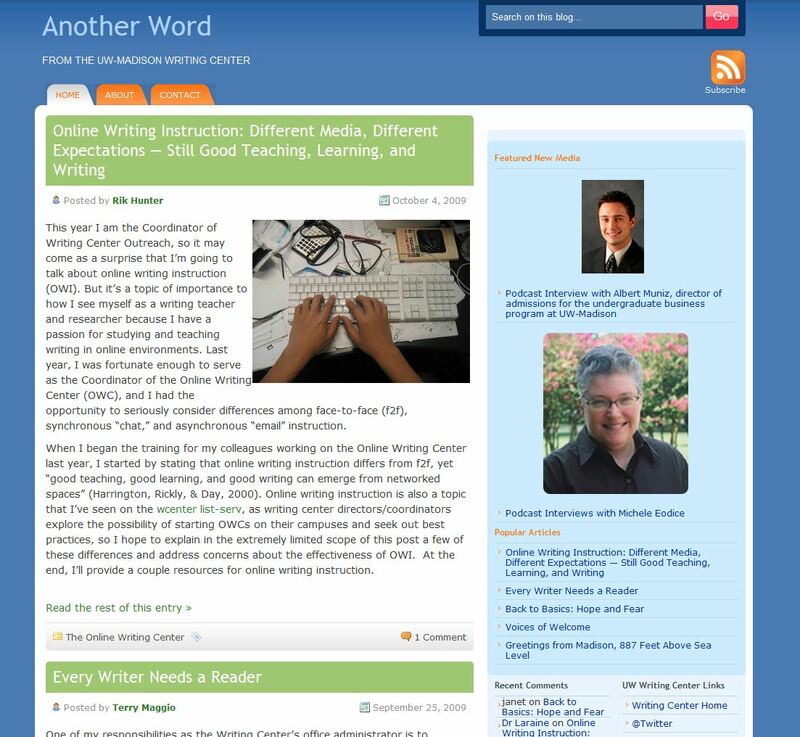 “Writing Center Websites, Then and Now.” The Writing Lab Newsletter 34.4-5 (2009/2010): 6-9. Print. Pegg, Bruce. “UnfURLed: Twenty Writing Center Sites to Visit on the Information Superhighway.” Wiring the Writing Center. Ed. Eric H. Hobson. Logan, UT: Utah State UP, 1998. 197-215. Print. Vee, Annette, Mike A. Shapiro, Nancy Linh Karls, and Brad Hughes. “Podcasting the Writing Center: Notes on Design and Production.” The Writing Lab Newsletter 35.1 (2009): 1-6. Print. What a wonderful post! 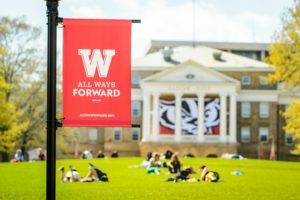 I remember some of the early UW–Madison pages from when I started in the writing center field, especially that one from 2002, and it is nice to see them again. This is not only valuable for understanding the evolution of the Internet, it is also a great reminder for saving archival materials. To continue evolving as a field, we need to have a strong understanding of our past—so we should be smart with the ways we save our materials, both online and physically in our centers. I hope you will be willing to share this with the IWCA and the WCRP. I also appreciate you mentioning that we should do a better job recognizing online and in-person as “intertwined” rather than “distinct.” Our Writing Fellows program has been working to bring these areas closer together this fall, and it’s quite common now in our studio to see an online session taking place at a computer right next to a face-to-face session. The service the UW-Madison center has provided to the university and to the world has been phenomenal, and we owe you a great deal of gratitude for providing such fantastic materials! This is a history to be very proud of. So many great names have played a part in the development of your online writing center. Reading this history reminded me of our early days, too. We began with e-mail attachments. The biggest challenge was managing the files, incoming, outgoing, and every stop in between. Some things don’t change all that much. Best of luck to you all in the next two decades of your online writing center! What a wonderfully detailed description of all the hard work we’ve done over the years! Thank you for sharing it with us. I think it speaks to just how important and necessary it is for us to pay attention to the ways that writers engage with digital technologies. And as the content of writing center service continues to spread to more channels, it’s crucial that we keep up with changing distribution methods and delivery sources. Fantastic! I have fond memories of that page with the sailboat and the colored discs. The image of the boat on Lake Mendota seemed to promise good things to come. It’s amazing how diverse online tools are today, to address the variety of students and their access to information. The list of different online offerings from the beginning of this blog posting boggles my mind, as I still remember receiving the emails (and later sending them out as the online coordinator). With all the different apps and tools available to give feedback on writing, I still find myself going back to what I think of as the gold standard as I learned it from Brad and the Writing Center — the face-to-face encounter. Every time I give feedback electronically, I bring the face-to-face meeting’s idea of a conversation. Everything I learned about writing comes from the UW-Madison Writing Center, and I feel as though we former online coordinators could benefit from an online class all to ourselves, as an alumni perk (hint). Brad, you are just amazing for keeping all the things you show us in this blog posting. It makes me feel less guilty about keeping stuff around for later… Thanks so much for showing us this history of the online writing center! What I think of immediately when reading Brad’s history are two things: (1) the potential for online history to be lost, and (2) the potential for the ownership of a writing center’s site, and thus the potential for revision and updating, to be handed over to the university. These are related concerns for me, as I explain below. Recently I was trying to find older versions of the Southeastern Writing Center Association’s website on archive.org. My search for earlier versions of the SWCA site was successful, but only because I was able to locate the old URL for the site before the URL was changed to http://iwca-swca.org . Before, it was http://www.swca.us. How I located that old URL? I used archive.org to view the IWCA’s website from 2008 or 2009 and visited the regional page and found the old link to SWCA. Then I searched archive.org for that URL and found the old SWCA site. Similarly, I wanted to find some information about one particular writing center prior to 2010, so I searched the current URL in archive.org. However, like the SWCA’s url, this WC’s URL was changed in 2010, so I found nothing on archive.org prior to 2010 for that URL. I tried the same process I had used for locating the old SWCA URL, except this time I had to enter through the university’s website, which linked to the writing center’s old URL. These examples illustrate both the potential for archive.org to facilitate historical research on online documents, but also the danger of losing historical documents due to URL changes. Of course, none of this would be possible without archive.org, an amazing tool that helped Brad to complete this historical project. Of greater concern, though, is the chance of a program losing its ability to inscribe its own unique identity on its website, and for tutors and administration losing the opportunity to experiment with design and content and to figure out how they want to represent their work/services online. 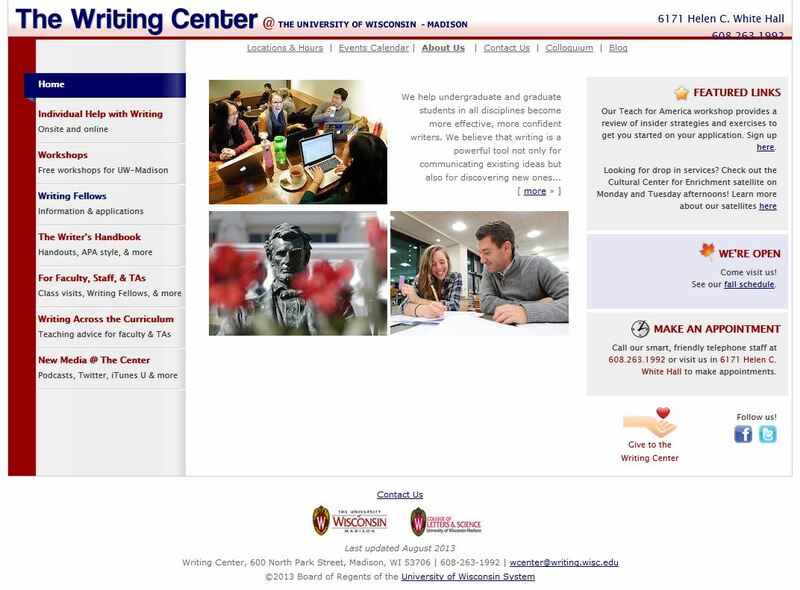 When universities decide to move official programmatic websites into a university marketing template, writing centers lose their ownership of the look and feel of the site, even when they retain permission to control content and text. Imagine if such a system had been ubiquitous (like it’s now becoming) in the late 1990s or throughout the 2000s. 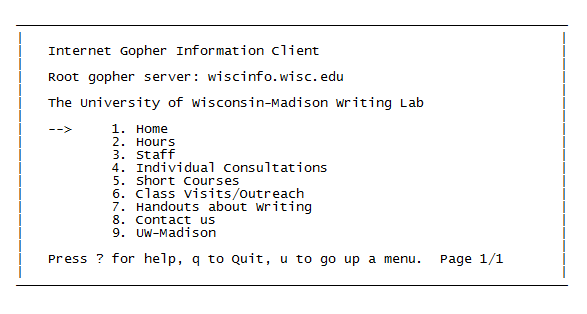 Perhaps the UW Madison WC site might not have had to endure the frames era that Bruce Pegg (founding editor of the IWCA website and my predecessor before Clint Gardner, by the way) and others found to be . . . how shall I put it . . . cumbersome to say the least. But wasn’t it nice that the UW Madison WC and Writing Fellows staffs were able to discover on their own what the creator of htmlgoodies.com Joe Burns, PhD in 1999 called a problematic feature for the “browserly challenged” among those of the 1990s internet surfers? I think so.